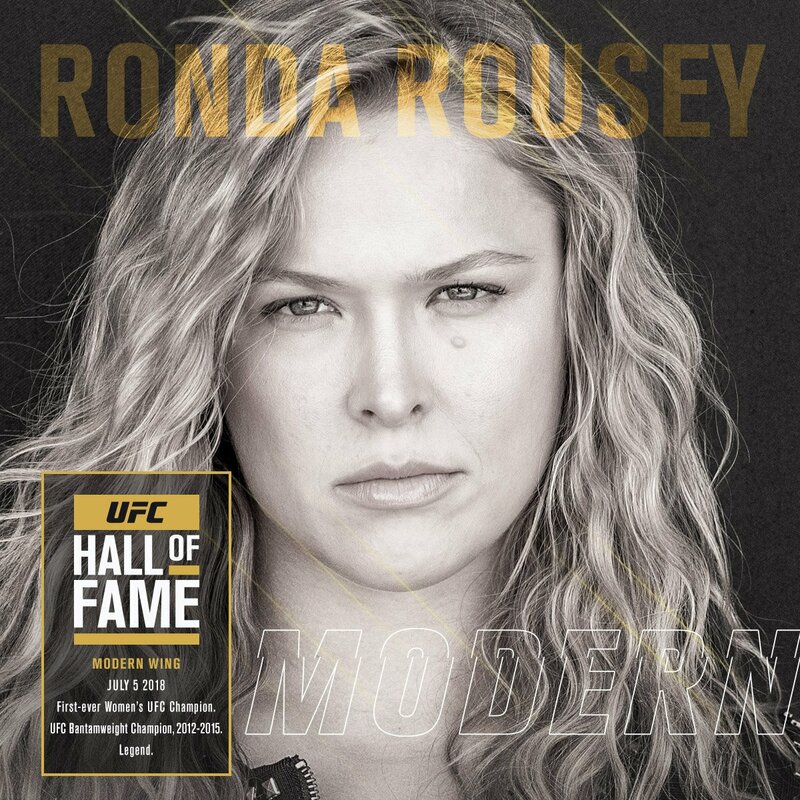 UFC® today announced that former UFC and Strikeforce® women’s bantamweight champion Ronda Rousey will be inducted into the UFC Hall of Fame’s ‘Modern Wing’ as a member of the class of 2018. The 2018 UFC Hall of Fame Induction Ceremony will take place on Thursday, July 5, at The Pearl at the Palms Casino Resort in Las Vegas. The event will be streamed live and exclusively on UFC FIGHT PASS® starting at 7 p.m. PT. Rousey will enter the UFC Hall of Fame as a member of the Modern Wing, joining Forrest Griffin (2013), BJ Penn (2015) and Urijah Faber (2017) as the only members of this distinguished category. Rousey also joins Faber as only the second athlete to be inducted into the UFC Hall of Fame from the bantamweight division. The “Modern Era” category includes athletes who turned pro on or after November 17, 2000 (when the first UFC event under the unified rules of MMA was held), are a minimum age of 35 or who have been retired for one year or more. As the first female fighter signed to UFC following the global brand’s purchase of Strikeforce, Rousey was named the promotion’s first-ever women’s bantamweight champion in November of 2012, and she debuted inside the world-famous Octagon® at UFC® 157: ROUSEY vs. CARMOUCHE, on February 23, 2013 at the Honda Center in Anaheim, California. Ronda defeated Liz Carmouche in the first round via armbar, becoming the first woman to win a UFC bout while defending her title in the process. A veteran of 14 professional fights during her five-year career, Rousey, the last Strikeforce women’s bantamweight champion and first-ever UFC women’s champion, compiled a record of 12-2, setting numerous records, highlighted by her six consecutive successful title defenses, the most by any female champion in UFC history. During her tenure in UFC and Strikeforce, Ronda secured seven submission victories via armbar, tying UFC Hall of Famer Minotauro Nogueria for most armbar submissions in the combined history of UFC, PRIDE, Strikeforce and WEC. A prolific finisher, Rousey owns records for four of the five fastest finishes in UFC women’s bantamweight history, while her three wins by KO / TKO rank as the second most in UFC women’s bantamweight history. No other fighter in UFC history owns more than two of the five fastest finishes in their respective division. Rousey’s average cumulative UFC fight time of 3:06 ranks as the second shortest in UFC history (min. five fights) and her collective Strikeforce fight time of 1:36 ranked as the shortest in company history (min. three fights). Ronda’s 14 second armbar submission victory over Cat Zingano at UFC® 184: ROUSEY vs. ZINGANO, was the fastest submission of the Modern Era and of any title fight in UFC history. Rousey also holds the record for fastest submission in Strikeforce history with her 25-second victory over Sarah D’Alelio during her debut at Strikeforce Challengers: Gurgel vs. Duarte on August 12, 2011. As one of the most complete mixed martial artists in combat sports history, Ronda also holds numerous records for finishing her opponents via knockout. Her 16 second knockout of Alexis Davis at UFC® 175: WEIDMAN vs. MACHIDA is tied as the third-fastest knockout in a title fight in UFC history. Lastly, her 34-second knockout of Bethe Correia at UFC® 190: ROUSEY vs. CORREIA and 1:06 knockout of Sara McMann at UFC® 170: ROUSEY vs. MCMANN, are the second and fourth-fastest knockouts in UFC women’s bantamweight history, respectively. Ronda headlined six UFC events during her career, including UFC® 193: ROUSEY vs. HOLM, which was held at Etihad Stadium in Melbourne, Australia on November 15, 2015. UFC 193 recorded a total attendance of 56,214 fight fans, which stands as the largest-attended event in UFC history. Outside the Octagon, Rousey’s global popularity continued to rise as she was recognized by both her peers and the media with some of the most highly acclaimed awards in sports. In 2015, Ronda became the first mixed martial artist to win an ESPY award for “Best Fighter,” and she was also acknowledged by ESPN with the ESPY for “Best Female Athlete” in 2014 and 2015, and in 2012 for “Submission of the Year” after her first victory over former UFC women’s bantamweight champion Miesha Tate. In May of 2015, Sports Illustrated recognized Ronda as “World’s Most Dominant Athlete” as she graced the cover of that month’s issue. Later that month, Rousey also became a published author with the release of her autobiography entitled, “My Fight, Your Fight”, which chronicled her inspiring path from Olympic judo medalist to Hollywood star. In November of 2015, Ronda became Electronic Arts’ first female global cover athlete with the release of EA SPORTS UFC 2 and also made history as the first woman to be featured on the cover of Men’s Fitness Australia. While an active UFC athlete, Rousey also became a global movie star, appearing in films such as The Expendables 3, Furious 7 and Entourage, which collectively grossed more than $1.8 billion dollars combined in worldwide sales. She has also headlined popular television shows and series in primetime, hosting Saturday Night Live in 2016 and making a cameo appearance on Blindspot in 2017. Later this year, Rousey will co-star in Mile 22 with Mark Wahlberg and Academy-Award nominated actor John Malkovich. Along with acting, Rousey is also currently a performer with World Wrestling Entertainment, where she competes weekly as one of the company’s top superstars on Monday Night Raw. A native of Riverside, California, Rousey’s martial arts career began at age 11, when she started training judo with her mother, AnnMaria, a highly-decorated judoka who became the first American to capture a World Judo Championship in 1984. In 2004, at the age of 17, Ronda won the Gold medal at the World Junior Judo Championships. That same year, she qualified for the 2004 Olympic Games, becoming the youngest judoka to compete in the games that year. In 2006, Rousey won the Bronze medal at the World Junior Judo Championships, becoming the first U.S. athlete to capture two medals at the World Junior Judo Championships. Her ascent as a judoka continued in 2007, as she won the Gold medal at the Pan American Games and Silver medal at the World Judo Championships. In 2008, Ronda captured the Bronze medal at the Olympic Games, making history as the first American to win an Olympic medal in women’s judo since the sport joined Olympic competition in 1992. Overall, Ronda won more than 30 medals and represented the U.S. Judo team in over a dozen international tournaments. She currently resides in California with her husband, UFC heavyweight Travis Browne. To view the UFC Hall of Fame fight library, please visit UFCHOF. To see a complete list of UFC athletes and fights enshrined in the UFC Hall of Fame, as well as details regarding the UFC Hall of Fame format, please visit UFCHOFFAQ. For additional information, please visit UFC.com.